Ad spend in Australia and across the globe is looking healthy, according to the latest industry predictions from Carat. The global media agency has released its Ad Spend Report for 2016, predicting a 4.5 per cent increase in global ad spend by the end of this year and a 2.5 increase in Aussie ad spend. And they’re similar predictions to what media agency ZenithOptimedia said this past week. In dollar figures, that’s $US538 billion ($AU701.66 billion) globally. It’s down to big global events, believes Carat, such as the US Election, the Olympics and Paralympics. Unsurprisingly, the figures reaffirm the rise of digital. 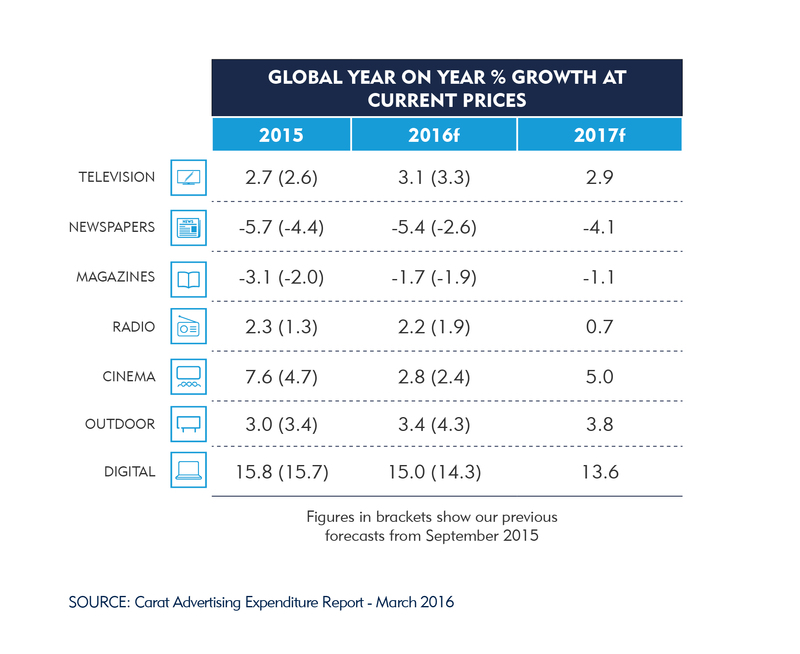 Digital will account for 27 per cent of global ad spend in 2016, predicts Carat, and 29.3 per cent in 2017. In 2017, it will reach $US161 billion globally. The increase of mobile year on year has been 37.9 per cent, online video at 34.7 per cent and social media at 29.8 per cent. The increase in digital penetrations is expected to increase 15 per cent this year, and 13.6 per cent in 2017. In Australia, the 2.5 per cent growth equates to $13.7 billion by the end of the year. Carat puts the slight improvement down to the Government change and improved sentiment in the electorate. 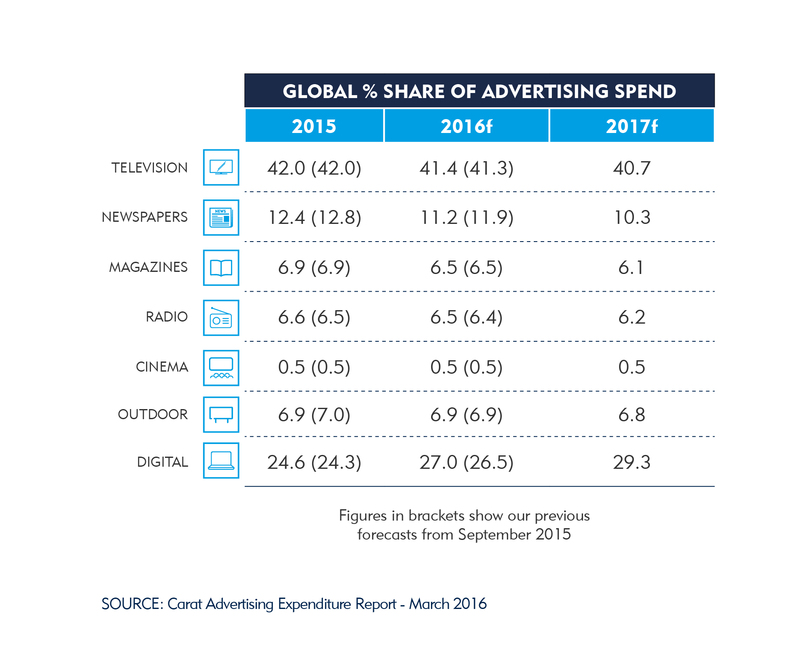 “Overall, 2015 was a record year for advertising, with media spends up 5.1 per cent YOY from 2014. This was the best YOY growth since 2010 according to SMI,” said newly minted CEO Simon Ryan. The end of last year saw a slow December with no growth, January was up by one per cent and February up by 2 per cent, he added. Ryan added: “Online display is the fastest growing digital sector, forecast to grow 14 per cent in 2016, to achieve 34.4 per cent share of total online investment. “Out of home advertising is growing to 6.5 per cent share of total ad spend, chasing Radio on 7.8 per cent share of total ad spend. It is expected to overtake radio in 2019. “I expect 2017 to continue steady growth at a slightly lower rate of 2.3 per cent without the booster effect of the Federal Election-related spending and the usual lag effect caused by the Olympics in 2016.